debuted in the Silly Symphonies Sunday newspaper comic on Jan. 10, 1932 — less than four years after the release of the first Mickey Mouse cartoon. Between his first appearance and 1934, when his tenure in the strip ended, Bucky lived his entire youth in the Silly Symphonies strip. He was born (in a litter of 17), grew up, had a lot of youthful adventures, and finally married his sweetheart, June, daughter of the Mayor. Ten years later, Bucky's story was continued in the back pages of Walt Disney's Comics & Stories. Tho married, Bucky had apparently not lost his taste for adventure. Sidekicked by his pal, Bo, whom he'd met during his youthful wanderings, he had a new one every month until #120 (September, 1950). In #121, he was replaced by Grandma Duck. Bucky would scarcely be remembered in America, were it not for the fact that the scripts were written in meter and rhyme. This distinction has kept interest in the character alive for decades (albeit at a low level), leading to sporadic reprints and even an occasional attempt at revival. A recent such attempt occurred in 1998. 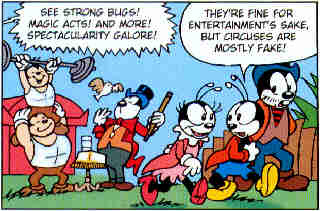 Gladstone Comics published a series of six Bucky Bug stories, in which rhyming English-language scripts, written by Donald D. Markstein, were applied to stories first published in The Netherlands. Bucky does have a curious connection to Disney animation, however. In 1947, an elderly bug named Bootle Beetle became one of his supporting characters. Bootle also appeared in several Donald Duck cartoons — which stands as the only known indication that there is any connection at all between Bucky's little junkpile world and the universe in which nearly all other Disney characters reside. Text ©2000-10 Donald D. Markstein. Art © Walt Disney Co.